A soothing balm specially formulated for year round dry skin relief. 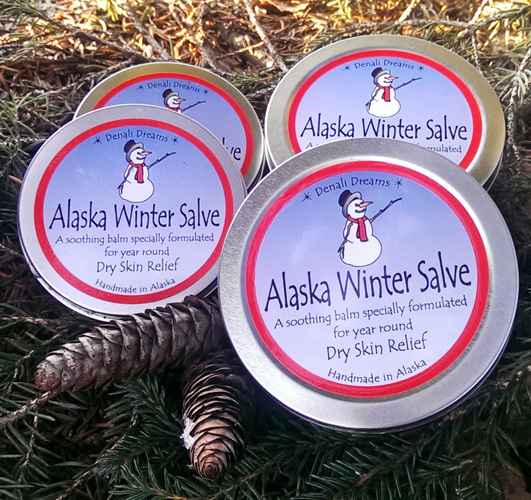 Alaskan winters can bring harsh cold weather that damages skin, so we blended up a salve to help soften dry chapped skin. Use to soften cracked heels, rough hands, elbows, or any dry patch that needs special care. Scented with essential oils of lavender, lemongrass and sage. Offered in 2 oz and 4 oz sizes. Large – 4 oz., Small – 2 oz. Just started using it seriously in the last week. I used it on and off in the winter with great results for moisturizing. Now, I love it. I like the fragrance, and in reading the ingredients I realize it is all natural and the stuff I love. Olive oil, avocado oil, aloe, beeswax and more of just the right stuff. A nice smooth feel going on and a tiny big goes a long way. I felt results overnight on my dry hands. Fabulous.